Maybe you’ve got thousands of links saved to Pinterest, or maybe you’ve only bought a cot and can’t even decide what bedding to get. Either way, working out where to start with a baby’s room is tricky. If you’re still pregnant and haven’t even met your baby, it’s trickier still. Not to worry, Belinda Nihill, the interior designer behind Nest Design Studio has released Beautiful Babies’ Rooms, a book that gives inspiration and tips for nursery decor. Beautiful Babies’ Rooms is full of nurseries Belinda has designed over the years, and includes photos and the process behind the designs. She shares insights into how to create a special space for a baby, and tips on how the pros approach layout, decorating and styling. As a starting point, Belinda says to think about things that are special to your family. Do you have a favourite holiday spot, a song you always sing? Incorporating personal touches inspired by your family will create a unique room. She advises not to get hung up on finding styles that will stand the test of time. Trends change constantly, and anyway, your baby will be a dinosaur loving toddler before you can say Diplodocus, so you’ll have to replace the whimsical hot air balloon mobile with stegosaurus wallpaper anyway. 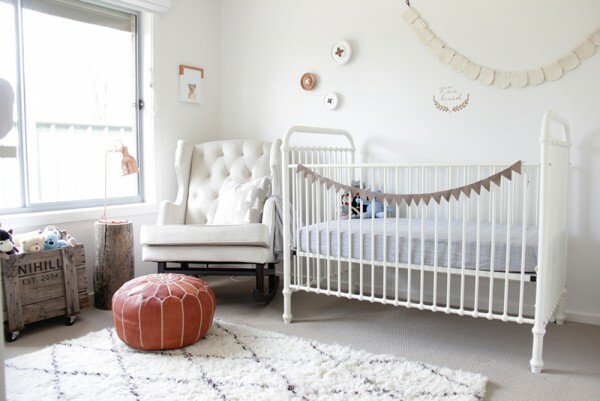 Her favourite trend in nurseries is neutral colour palettes that are big on texture. Timber and leather accessories are lovely too and give depth to a space. For parents living in small spaces and who will be sharing their room with their baby, Belinda creates a special corner of the room by putting the bassinet or cot under a canopy, or hanging a beautiful piece of artwork that draws on the colours of the baby’s linens. Beautiful Babies’ Rooms is available online and ships in Australia for $5.